When the doors of the Jeanne’s yarn shop Unwind kicked off its grand opening in August, I attended the cocktail party along with several invited guests. As part of the fun, all of our names were put into a drawing for door prizes. Creatively, each door prize was written on a slip of paper hidden inside a skein of yarn. When my name was chosen, I selected the ShiBui Knits DK Alpaca and won a year’s worth of yarn tastings. Wait, what is a yarn tasting, and why partake in one? Like wine, yarn can be cheap and it also can be pricey. I have “colored string” in my stash that ranges from as little as $3 to as much as $100 per unit (ball/hank/skein). 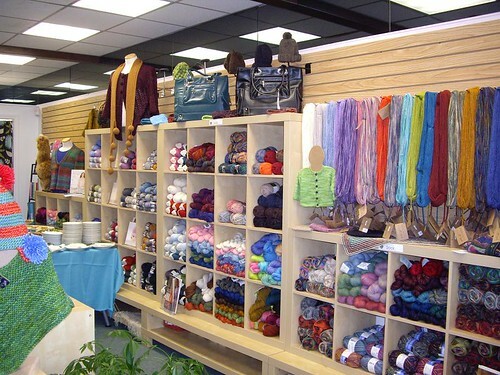 Yarn is a knitter’s investment for potential. If a project (using a cardigan as my example) states to use 12 units of a certain yarn, the knitter should purchase a ball of it before deciding to purchase that commitment or find an appropriate substitution. Nothing can be more aggravating than buying 12 units of yarn at $10 each, and then discovering that the yarn is not working out as expected. Thinking of the saved potential costs, a yarn tasting allows a person to try out a yarn before buying it outright. If the knitter does enjoy the feel of it through the fingers, then a purchasing decision can be made. Similarly, when trying to decide on a color for painting a room in the house, one gets a small amount to test on the wall instead of painting the entire room and discovering the purchased shade is not the desired color. So… I won a year’s worth of yarn tastings at Unwind, and the first was held on Thursday, September 10th. Running a bit late, I walked into a packed house of what seemed over two dozen tasters. I quickly picked up a chocolate brown Asian take-out box and folder, then found a seat with Juanita and Paulette. 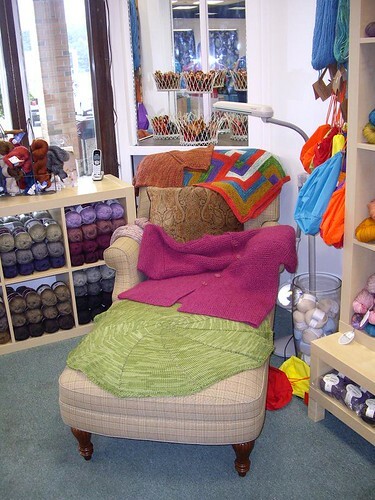 Noro Kureyon, Noro Silk Garden Sock, Misti Alpaca Baby Grande, and Filaturo di Crosa Zara were just a few of the fibery goodies to taste. Inside the folder were suggested patterns for these yarns. A quick scan and I saw many possible Christmas and holiday presents for friends and family. Yarn tastings sound like fun although for whatever reason I never seem to be around when our shops have them.